Brazilian contemporary dance company Grupo Corpo returned to Birmingham Hippodrome with a double bill. While the two pieces, Sem Mim and Parabelo, have very different roots there is nevertheless a symmetry between them. Created by choreographer Rodrigo Pederneiras in 2011, Sem Mim is inspired by a Medieval Galician songbook which celebrated the sea of Vigo – and the people whose lives were touched by its waves. With a haunting series of songs, the groups of dancers move gently and rhythmically across the floor all in perfect time much like the ebb and flow of the waters. Their rippling bodies echo the ripples of the waves as they pass back and forth in front of us. There is a peace and regularity to this movement while occasional breakouts of angularity remind us that the sea is never to be underestimated. Freusa Zechmeister's costumes are an integral part of Sem Mim's bold design. Each person has their own bodysuit decorated with symbols inspired by the Middle Ages. This creates an impression of body tattoos which move as each body moves – creating wave upon wave of undulating artwork. Parabelo is an altogether more exuberant piece. Also choreographed by Pederneiras, it has become a signature work for Grupo Corpo since its creation nearly 20 years ago. 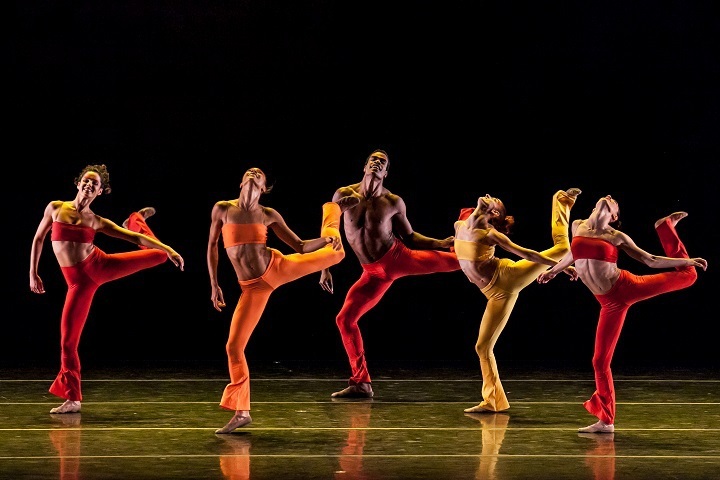 Inspired by the life and energy of Brazil, Parabelo mixes sinuous duets with lively corps moments where all the dancers are moving separately and yet as one. By its close, the stage is filled with bright red, orange and yellow costumes and the dancers have gradually turned up the heat so that we see a dash of motion and colour full of the spirit of life.